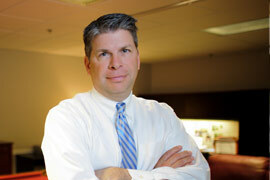 Mr. Potenza is a principal of HCP and one of the lead attorneys in the Healthcare Trial group. Mr. Potenza's primary area of practice is the representation of healthcare professionals and organizations in medical malpractice litigation. Mr. Potenza has represented hospitals and hundreds of physicians, nurses, and other healthcare professionals. Mr. Potenza has successfully tried cases in virtually every court in Northeast Ohio, including Cuyahoga County, Summit County, Trumbull County, Mahoning County, Medina County, Portage County, and Lorain County. Mr. Potenza has also successfully handled many cases in the Court of Appeals and before the Ohio Supreme Court. In 2010, Mr. Potenza successfully argued to the Supreme Court that courts should limit the use of John Doe pleading in medical malpractice actions. This decision effectively ended a practice which had been used by plaintiffs to artificially extend the statute of limitations applicable to health care professionals. Erwin v. Bryan, 125 Ohio St.3d 519. During his 20 year career, Mr. Potenza has also been involved in many areas of civil litigation, including general liability, products liability, professional malpractice, physician misconduct, transportation litigation, and business litigation.